NYC is Blue: Wall Street Journal: "700 Soccer Fans and Counting"
Wall Street Journal: "700 Soccer Fans and Counting"
Tomorrow morning's Wall Street Journal will feature on our group on the first page of the "Greater NY" section, and the online version is up now! I'm featured pretty prominently, which is a great honor. Jocelyn Perez, left, and Jodi Honeycutt pick up their Third Rail membership cards at an Aug. 9 meeting of the group. 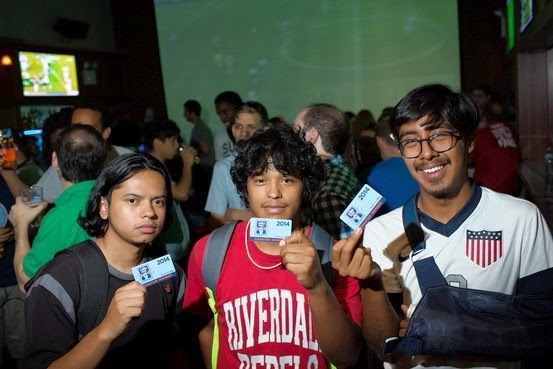 When the clock passed 2 p.m. on a recent Saturday at the Midtown sports bar Nevada Smiths, a crowd of several dozen soccer fans had already ensured that the third meeting of the Third Rail, the independent group formally recognized by New York City Football Club as its official supporters society, would be the largest in its short history. Despite the strong showing, group president Chance Michaels waited a bit to start the meeting. After about 20 more people arrived, he opened with a few items of pressing business: Membership cards would be distributed for the first time; a vote on the design for the group's charter-member scarf would be held; and, most important, the Third Rail had secured exclusive ticket access to sections 236 and 237 for home games at Yankee Stadium, where Major League Soccer's new expansion franchise will begin play in 2015. These are the kinds of details that a budding fan base must hammer out ahead of game day. "The state of the Third Rail is booming!" Michaels proclaimed, surveying the throng of fans whose favorite soccer team barely even exists. Like the Third Rail, NYCFC is still under construction. Its payroll currently comprises six players and two coaches, and its home at Yankee Stadium is only temporary, with a permanent stadium and training facility as yet unsecured. By contrast, its unaffiliated fan group has a roster of more than 700 people. They began to assemble on the very day in May 2013 when the Yankees and the English Premier League's Manchester City Football Club unveiled their plan to co-launch an MLS franchise in New York. "When we originally found each other, we had a name, an ownership group and not much else," said Michaels, who has worked as a theater producer in New York. "A bunch of us found each other on social media in the aftermath of the announcement and said, 'We are going to follow this team.'" In the 15 months since, that initiative has pulled itself up by unfinished bootstraps. The nascent group, which adopted its name via a member vote, held its first meeting in February. In May, a leadership group was formed, and another general-member meeting was held in June. They played out more like auditions. Some fans signed up immediately; others were there to get a feel for the team, the group and the people involved. "I set my goal at wanting 500 paying members by the time NYCFC played its first game," Michaels said. "We eclipsed that in a couple of months. We did our first big membership drive, we started taking memberships online and the effort just blew up." Michaels and his leadership group have employed various tactics to attract new members. During the summer, they exploited World Cup fever by staging viewing parties around the city. There they recruited new members, searched for an official game-day pub, and co-hosted a gathering for the semifinals with NYCFC officials. Though it is wholly independent, the Third Rail can mine its early collaborations to ascend to the level of the MLS's elite supporters clubs. 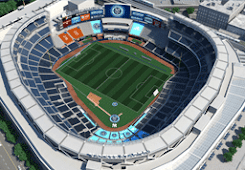 "This is different than some of the more recent expansion markets like Seattle, Portland, Montreal, where those teams and brands had previously existed in their market before jumping up to MLS," said Tim Pernetti, NYCFC's chief business officer. "To see the direction, organization and vision that they have in place in just over one year, for a club that has never played a game and only has a handful of players, is very impressive." NYCFC became aware of the Third Rail during the group's first round of organized events, and approached it in February—on social media, of course—about forging a relationship. "Our staff connected with them through Twitter and started a conversation with some of the people that got their group started, said Pernetti. "We have been in constant communication since." It was important to Michaels and his group that they develop organically, with no direct involvement from the team, a preference NYCFC has thus far respected. "We are open to whatever type of relationship the Third Rail prefers, [because] we recognize them as our first official supporters group," said Pernetti. "Supporters' culture in soccer and in MLS is different than other sports in [America]. These groups are independent and able to have their own voice." The deference the team pays the group is a selling point for the recruitment effort, although its leaders go to lengths to ensure that prospective members are aware of the alliance. "You don't see a lot of clubs directly shout out their supporter clubs like that," said Brooklynite Jeff Weisinger, 27, who was at the meeting at Nevada Smiths. "I joined for the FC, but the closeness that the Third Rail has developed with the team is probably what kept me here. It's awesome to see." Weisinger was referring to Third Rail FC, a soccer team made up of group members that was initially intended as an icebreaker. Now it's one of the Third Rail's biggest membership drivers. Erwin Seguia, a physical therapist from Astoria who also plays with Third Rail FC, recognized a lot of faces at the meeting. "A lot of guys that were there were from the practice pitch," he said. Since the meeting, the club's membership has surpassed 700, a blue and orange scarf design has been chosen, and Third Rail FC's first-string team reached the semifinals of the seventh annual Supporters Cup Tournament, which was sponsored by NYCFC. The MLS's newest team has plenty of work to do, but it can take comfort in knowing that its fan base is taking care of itself and will be ready when players yet to be signed take the field in March. "The third rail powers the subway, the lifeblood of New York City," Michaels told the crowd at Nevada Smiths. "The Third Rail wants to power NYCFC. You don't step on the third rail, and when you're in Yankee Stadium next season, everyone will know why."